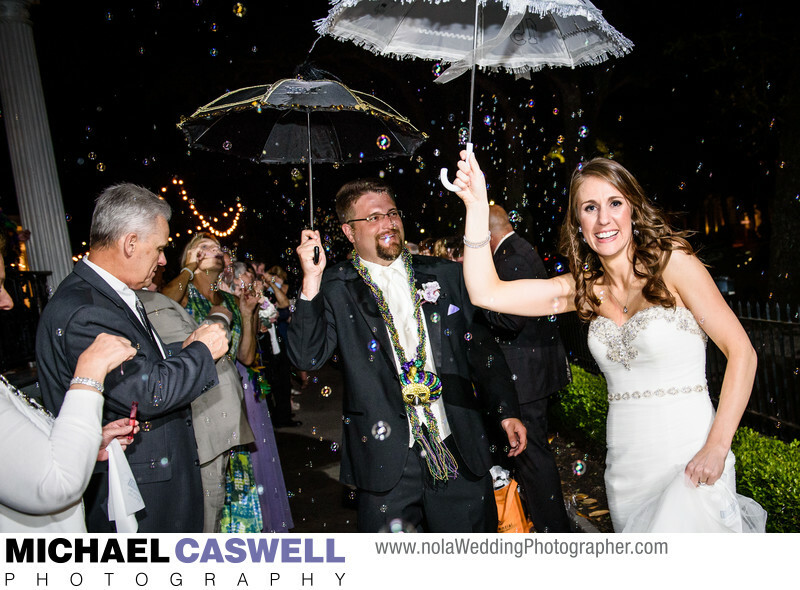 This fantastic wedding at the Elms Mansion in uptown New Orleans was capped off with a second line around the grounds, with the bride and groom then departing through a swirling shower of bubbles courtesy of their guests. The couple and some of the guests then climbed aboard the waiting chartered streetcar that would take them back to the French Quarter where the party was to continue. Though sparklers are a popular grand send-off accessory, bubbles have the benefit of being much easier to coordinate, as you don't have to be vigilant about guests lighting their sparklers prematurely and then having them fizzle out before the bride and groom are ready to come out. And this option is also indisputably safer as well! Some venues will not allow sparklers due to the potential danger of damage to the building, especially if it's an older structure constructed mostly of wood. A few venues will also not permit any throwable materials such as confetti, flower petals, and bird seed, due to the cleanup required afterward. Bubbles alleviate these concerns and look great too! Located on St. Charles Avenue, the Elms is a romantic and beautiful wedding venue that truly captures the unique character of Uptown New Orleans. The beautifully manicured grounds, spacious garden and patio area, the ambiance of the streetcars rumbling by, and the pure elegance of the mansion's interior all make for a memorable ceremony and reception.